I am so psyched to review today's book that I'll get through the Great Monday Give quickly. 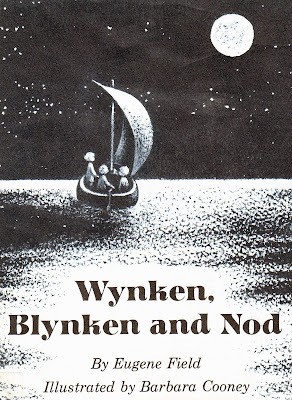 Wynken, Blynken and Nod by Eugene Field with illustrations by Barbara Cooney; a hardback, ex-library book in very good condition. To be entered to win? Just leave a comment on this post before midnight ~ Sunday, September 21. I will select a winner at random and ship the book to them FREE OF CHARGE! The lovely California girl, Brooke at please hello who is all for bunnies stealing the moon. Congrats and all that jazzy jazz... please send me your info to webe(at)soon(dot)com and I will get the book to you as fast as humanly possible, that is if that human is a 102-year-old woman, confided to a wheelchair, who relies on her irresponsible, 22-year-old home-health care aid to get her to the post office once a month. Now, for The Big Orange Thing! I don't know if I have ever read this book - but I love Barbara Cooney! Please include me in the draw. How cute. I would love to win this for my kids. I've honestly never read this book for some reason, but have heard quite a bit about it and would love to read it now. Where in the heck have I heard of this before? Were these characters in a disney movie or something? I love Cooney! This one looks beautiful, I think my son would love it. I love his one- and a beautiful old book is so lovely. It would be great to own this book. That book looks great, I'd love to win it! My son likes books and me too! I like their little boat on the book cover. We would love a new book. i remember the nursery rhyme and the illustrations look great! A lovely book to give away! Oh, thank you, thank you! I'll be emailing you any minute. Yay! I love this book! the doobie brothers recorded it as a song on a kid's album called "In Harmony" in 1980. Also on the album are songs by Carly Simon and James Taylor - I think it's still available. The best kid's album ever!! 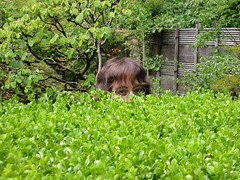 I just found your blog and I must say I love it. And I also love Barbara Cooney! What fun to remember all of these cool books I used to read but can no longer find. I just found your blog and feel I have found a kindred spirit. What a great idea! What a great story - not yet part of my collection yet!